I'm trying hard to reign in the excitement of Christmas until December hits, but I'd be lying if I said I hadn't started my plotting and planning and even my shopping already. I imagine most people are the same. Especially parents. So with that in mind I'm going to have a few giveaways on the blog between now and Christmas. I have a couple of lovely things lined up which will hopefully help towards ticking a few people off your list or even as a special treat for yourself. 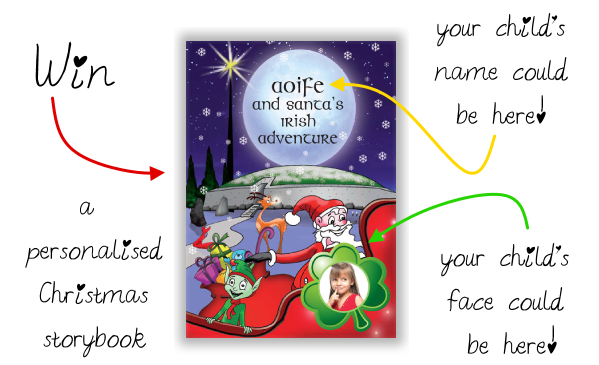 First up is a chance to win a personalised book from Digital Scribe for a little one in your life. When they contacted me and asked me if I'd like to review the book I had a horrible dilemma - which of my twin daughters do I choose to have featured in the book?! I agonised for - oh, about five seconds and then decided to have it made for my brand new niece instead. Mamas do not play favourites. Now, my niece is too tiny to even appreciate it this year, but I think it will be a really special reminder of her very first Christmas for her parents. I like to think that, by having it read to her every year, this story might even become a treasured part of her own family traditions one day. The story centers around the named child and an elf called Finbar as they try to find Santa, who got lost while chasing a runaway Reindeer. The two set off on the sleigh around Ireland trying to find the main man. They visit Newgrange, the Giant's Causeway, Blarney Castle and Dublin City on their journey and Finbar briefly describes the history of each landmark too. It's a sweet story that any child would love and, the facility for naming friends or siblings to be featured in the book really brings it to life. I had Lile and Sábha named in our copy and Santa lets my niece 'put presents under the tree' for them. I hope she enjoys this touch when she's older. Just to note also, there is a very brief mention of 'baby Jesus' at the beginning of the story and, while that suits my niece's family just fine, it might not suit every child. The book itself is an A4 sized paperback with a glossy, wipeable cover. The artwork is bright and colourful and includes a photo of the named child on the front cover. I would have loved to have seen a hardback or something a little more substantial and better bound for the €15.99 + P&P it costs, but I do think the story itself is really nice and I love the focus on the Irish landmarks. It's certainly something a bit different to the other personalised children's books I have seen on the market. Every book ordered comes with a free personalised letter, from Santa himself, which is another nice touch by Digital Scribe. The ordering process was really easy and the turnaround was super quick which is great to know when there's a festive deadline looming! They also assured me that they do not keep children's details on file and have a privacy statement regarding that on their site, which gave me great peace of mind when ordering for someone else's child. To order a book for a little one in your life, check out the website HERE or follow them on FACEBOOK for up to date news on this Irish start up. Disclosure: I was provided with a copy of this book for free for the purposes of review. All opinions are my own and I was not paid to give them.